Dear Girlface Giveaway: The Winner! Three cheers for everyone who commented and entered into the giveaway that I hosted with Jessica of Dear Girlface. If you missed the interview, you can check it out here! If you’re (unfortunately) not the winner, you can still get your hands on Dear Girlface merchandise (and who doesn’t want those cute buttons and stickers?!) over on the Dear Girlface Etsy shop! And in case you’ve forgotten what you entered in to win, it was this amazing prize pack with stickers, cute buttons, along with a top and skirt set that fits Neo/Kenner Blythe dolls. I feel like we all have at least one doll that would wear that ‘I’m a little BRAT’ top with pride. Congratulations Cherish! Your email will be forwarded to Jessica, who will be in touch with you about your amazing Dear Girlface prize pack! Interview with Jessica of Dear Girlface & Giveaway! I had the opportunity to interview Jessica of Dear Girlface and I’m pleased to share Jessica’s beautiful customizing work with all of you! She’s a vendor for the upcoming BlytheCon Brooklyn vendor this October If you’re a vendor for an upcoming Blythe event, get in touch! Hello Jessica, tell us about yourself! Hi! I live in a small town in NJ right over the bridge from Philadelphia with my wife and our two tiny black chihuahuas – Elvis and Memphis. I’m originally from California but moved out here to go to art school and loved it so much I stayed! I’m a graphic designer by trade, and used to do that full time although now I work for a clothing company where my duties are a bit more spread out. Occasionally I still get the chance to design! A good friend of mine has an impressive collection of vintage toys and dolls and she also has quite the collection of stock Blythes. I’d be at her house and always thought how cute they were but thought “Oh, I’m not really the sort to get into dolls.” How naive I was! Ha! 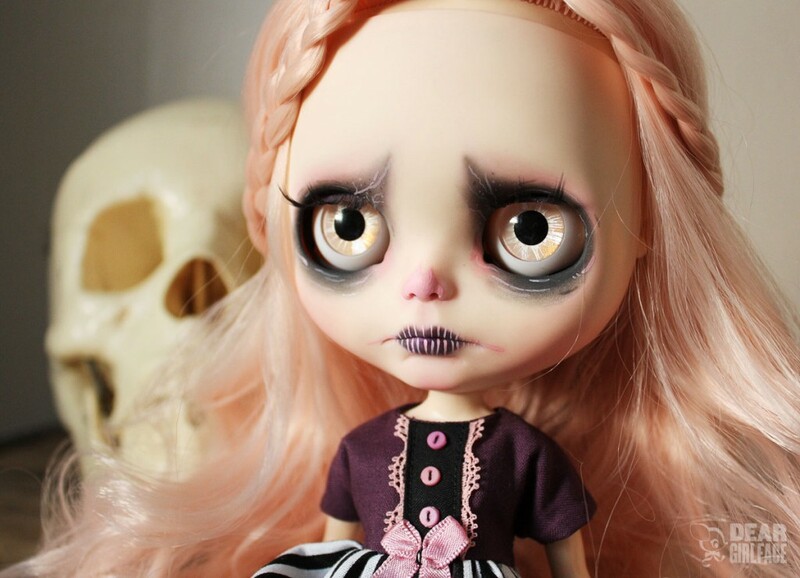 Fast forward to many years later, I was becoming a lot more active on Instagram and had noticed Blythes popping up here and there which sent me down a rabbit hole until I eventually discovered that people we’re customizing them. That changed everything! Suddenly the appeal of being able to create my own doll into whatever I wanted was very exciting. Before I knew it, I was researching them like crazy and had ordered my first TBL/factory doll, a redhead who I named Penelope. Who is in your Blythe family? 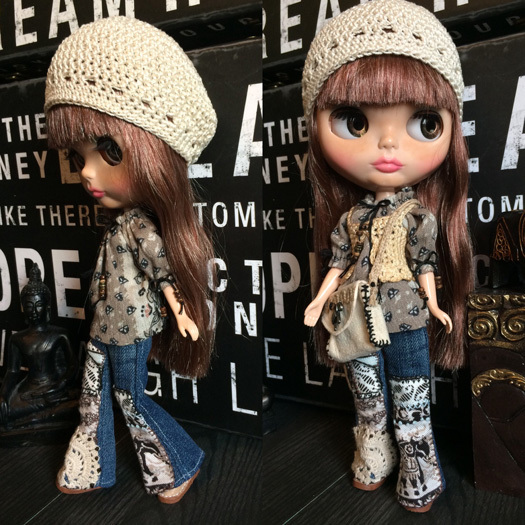 There are four TBL/factory girls that I customized myself: Penelope, Colette, Jinxie (my “mini me”), and Jupiter. Two that others customized: a Kawblam custom, Queenie Boom Boom (aka Boomie) and a Sweet Crate custom, Clementine. Then my Lounging Lovely, Millie; a Playful Raindrops/SM hybrid, Raina, and the newest girl – a UFO A Go Go named Starbuck. 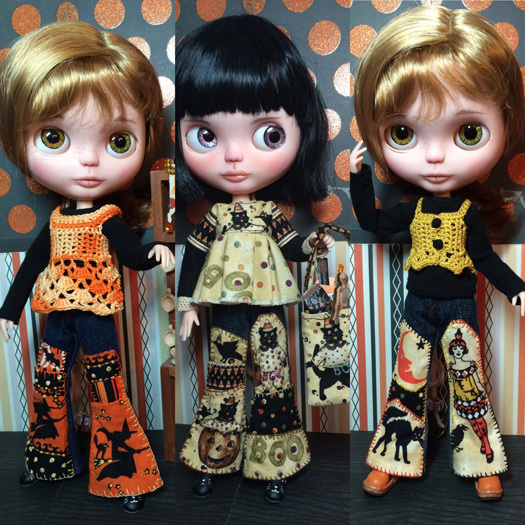 I also have a trio of custom LPS Blythe cuties all created by my dear friend, Denise Farinsky. 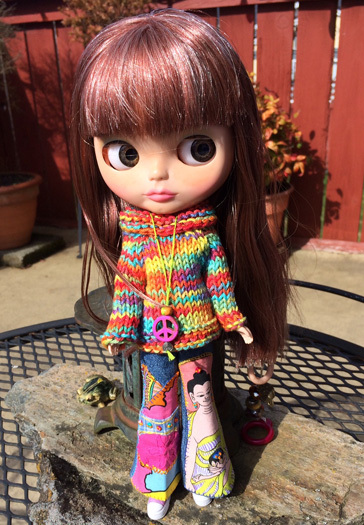 How did you get started customizing Blythe dolls? At the time, I was out of work on disability because I was very sick with chronic lyme disease and was facing the reality that I was probably going to lose my job. I wasn’t working, and even though I felt awful, I hated not having something to do creatively and was starting to go a little nuts. What I used to create were plush critters, mainly deer, and I wasn’t able to make those anymore because I had a lot of pain in my hands and hand sewing was out of the question. 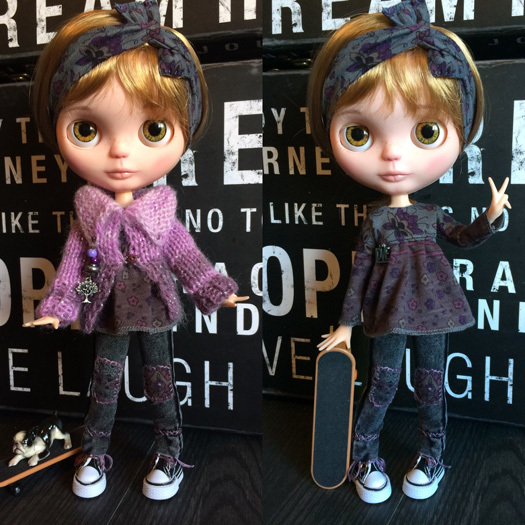 When I stumbled across the photos of custom Blythes, I thought I’d try giving it a go. I spent weeks researching on YouTube and reading as much as I could about customizing before I even dared pick up a knife. I figured my hands wouldn’t even let me do it! But once I started, I realized it wasn’t bad on my hands at all and it was actually pretty relaxing. It ended up being one of the very few ways I had for getting my mind off of all the pain I was in. Customizing requires so much concentration I didn’t have room for any other thoughts! Where do you find inspiration for your custom projects? Pretty much everywhere! In addition to swiping color palettes from things like vintage illustrations and fabrics, I look at a lot of interesting makeup artist’s Instagram accounts for face-up ideas. 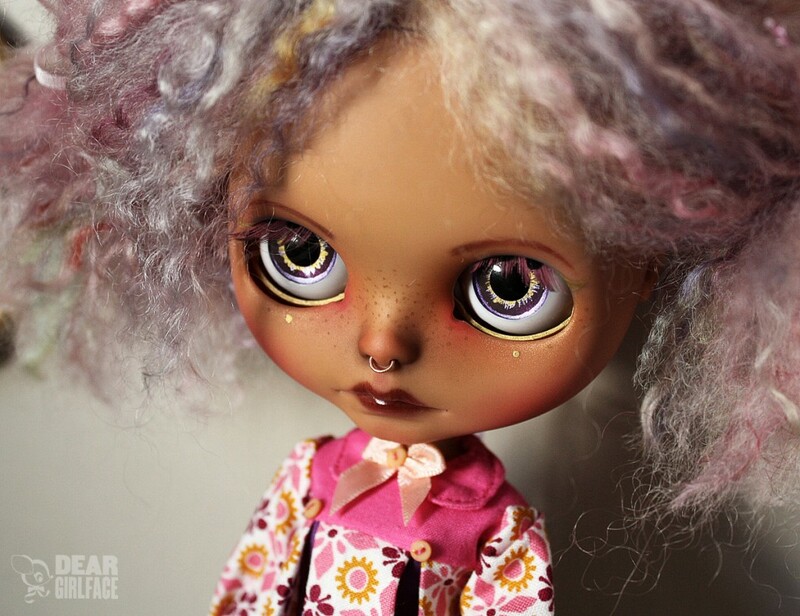 When I first starting customizing, all I did was look at other custom Blythes, but now I find it’s far more inspiring to look beyond that world for ideas. I’ve also recently become increasingly more fascinated with drag queens as their makeup looks are incredibly inspiring. Phi Phi O’Hara did a “365 days of drag” last year and some of the things she came up with were out of this world! 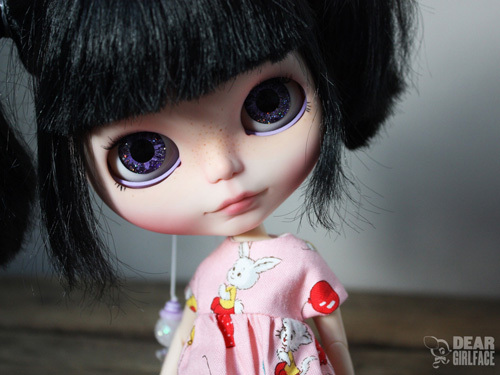 Who was your first custom Blythe that was sold? Tell us about that customization process. Well, a dear friend of mine was more than happy to let me “practice” customizing on some dolls for her in my beginning customizing days. In exchange for her providing the doll, I would do the customization work. So the very first custom I ever did for someone other than me was for her – a black haired dark beauty named Lydia. She had some specifications as far as lid art and makeup colors but pretty much let me do my own thing. It was very nerve-wracking to have someone else’s doll be at my mercy but she ended up turning out great! It’s never lost on me how trusting people have to be to let me create something for them – I’m incredibly grateful to my friend and everyone else that’s ever commissioned me thereafter. What tools could you not live without when it comes to customizing? I’m incredibly fond of my curved x-acto blade, anything else and I feel clumsy! It’s become like an extension of my hand. I also use a number of diamond needle files, and wood carving knifes. I’ve recently started upgrading my pastels to Pan Pastels brand and I love the intensity of the colors and their metallic and iridescent colors are fab for highlighting! With all the doll customizers out there, what would you say sets you apart from other customizers? Oh gosh. Well, I’ve always said I don’t try to just make “another pretty girl” – I strive to make a doll that is truly unique. My love for all things vintage and retro comes out a lot through my dolls as well. I tend to do a lot with interesting picture eye chips and I love playing with colors and unusual palettes too. You also sew as well! What’s the trickiest thing you’ve discovered with sewing for dolls? Oh, it’s all so different when it’s so tiny! But I’d say the thing that still trips me up is collars, I’ve probably tried 10 different patterns for them and it never turns out as good as I want it to! It’s my goal to get those conquered! I recently discovered that switching to a 1/4″ presser foot really helps a lot with tiny stitches, so that’s been a welcome addition. How do you think your graphic design background has helped you when it comes to customizing dolls or creating doll clothes? Graphic design taught me a lot about use of color as well as scale and proportion, so it’s surprisingly a big help. It’s also given me a perfectionist complex, which is a blessing and a curse! Haha! I actually think just having a background in art school in general has helped a lot – I feel like I’m pretty good at looking at something and being about to duplicate it/figure it out. I’ve had some detailed requests for eyelid art before where I’ve doubted myself being able to pull it off…then I do it and go, oh, right! I went to art school! lol! What has been the most exciting moment (so far!) in your customization journey? The most exciting moment so far has to be when I sold my first custom to a complete stranger. That was incredibly validating! I’d also have to say that getting picked to vend at BlytheCon Brooklyn this year has been really exciting too! Thanks for doing this interview with me, Jessica! What’s some advice you have to give to someone who’s starting off with customizing for the first time? Thank you Michelle! My advice would be to learn and absorb as much information and technique as you can before starting for the first time. You’ll have many moments of doubt and frustration, but just stick with it and practice, practice, practice! You can learn more about Jessica and Dear Girlface on Etsy, Instagram, and Facebook. Dear Girlface Prize Pack Giveaway! 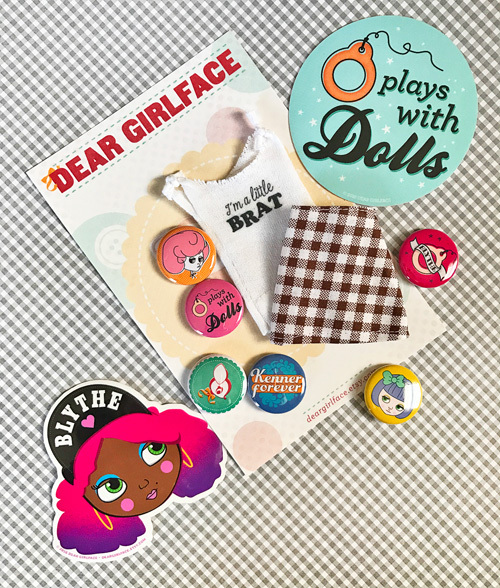 Jessica of Dear Girlface has generously decided to give away a tee and skirt set for Blythe with stickers and buttons! The giveaway runs until Saturday April 29th 2017 at 11:59pm Pacific. The draw will be held on Sunday April 30th 2017 and the winner will be announced on BlytheLife.com. Remember to use a valid email address for all comments. The winner’s name and email address will be provided to Jessica of Dear Girlface, who will be in contact with the winner. Please only use one email address per person, those using multiple email addresses for more entries will be disqualified. 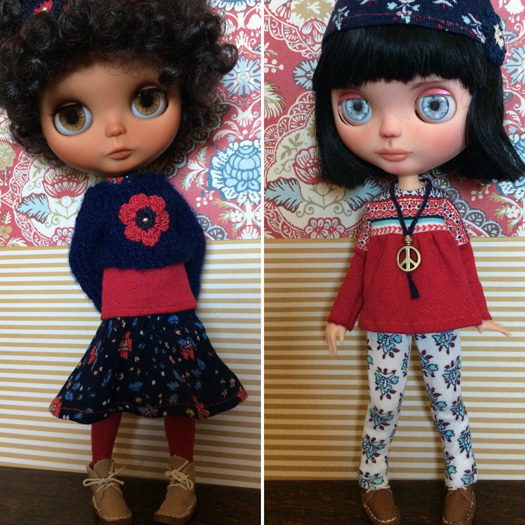 There was a lot of entries for the giveaway of the lovely Mizzfitzdolls outfit! In case you missed the interview, the giveaway was this super groovy set – complete with embroidered patchwork jeans, sweater (reversible! ), and peace sign necklace. Who doesn’t need a little bit of peace these days? Many thanks to Florance for doing the interview with me and offering up such a delightful prize! Congratulations Leif! Your email will be forwarded to Florance, who will be in touch with you about your prize! Little Matilda Atelier Giveaway: The Winner! Thank you to all the lovely readers and comments on my interview with Filipa of Little Matilda Atelier! It was fun and many thanks to Filipa for giving away this darling striped sweater to one lucky reader. It’s not too late to pop on over to her shop and check out what’s for sale if you didn’t win! Congratulations, Jules! Your email will be forwarded to Filipa who will be in touch with you about your prize! The third installment of the March Talent Showcase is Florance of Mizzfitzdolls! I’m excited to introduce her to all of you because she does some great one-of-a-kind embroidered pieces plus she’s sort of local to me, being in British Columbia as well. Let’s ignore how big the province is, shall we? Hello Florance! Tell us about yourself. I’m so pleased to be able to be a part of your March Showcase Michelle, thank you! About me… I’ll focus on the journey that lead me to designing and creating for Blythe. I studied costume design at the University of Lethbridge completing my Bachelor of Arts and Science and continued on to an MFA in design for theatre from the University of Victoria. Staying home and raising a family ultimately won out over a glamorous career in theatre and movies. Fast forward a number of years and I started recreating a design I’d developed back in the 70’s, one of a kind hand embroidered patchwork jeans that I shared in an article for Altered Couture magazine a few years ago. 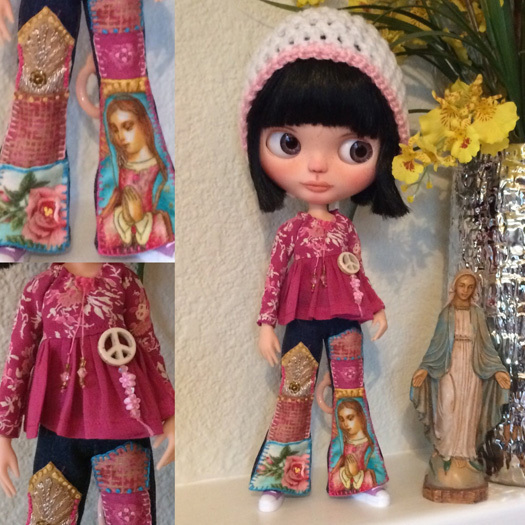 I started thinking about how adorable my jeans would be in miniature and I had this huge love on for Blythe so the two just went hand and hand leading me in to the world of designing and creating fashion for this amazing doll! I kept seeing these funky little dolls with the most amazing eyes! I’d always been a fan of the retro big eyed children art so these dolls really intrigued me. I particularly loved the customized ones and being on a budget required me to purchase very carefully…I found a new doll artist who was brilliant and I bought my first Blythe from her…and my second too. Who is in your doll family currently? Rose and Amelia are my first two customized Blythe dolls by artist Paula Saraivia of Kawaii Bjus. Cleo my third custom Blythe was purchased from a fellow Canadian whom I’m pretty certain customized this lovely girl. My most recent addition to my Blythe family was the first doll customized by Maria Zuniga and Penelope is the name I’ve given her. They are my precious models and work really hard for me….without much reward since I sell the clothing right off of them, poor dears. I also have a huge collection of MH dolls, many of whom I customized myself. 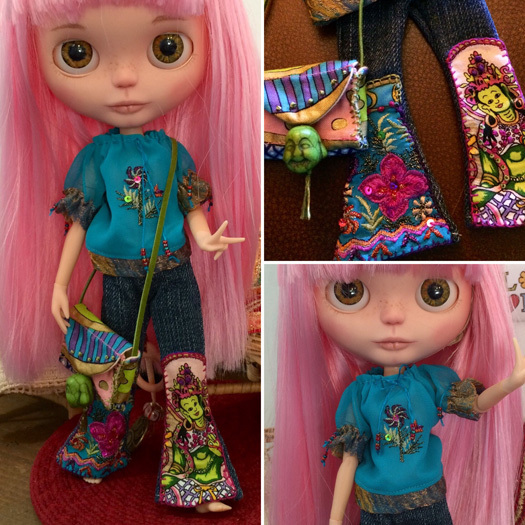 How did you get started sewing for Blythe? 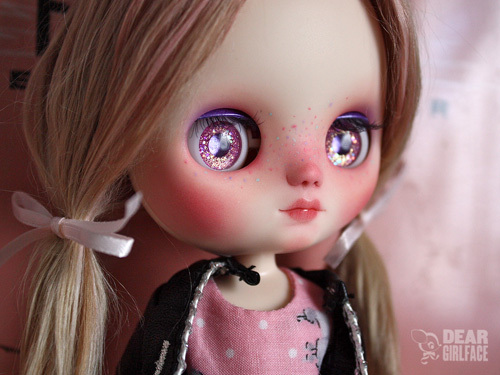 As a designer it was so wonderful to discover Blythe doll bodies, traditional, Licca, Azone. 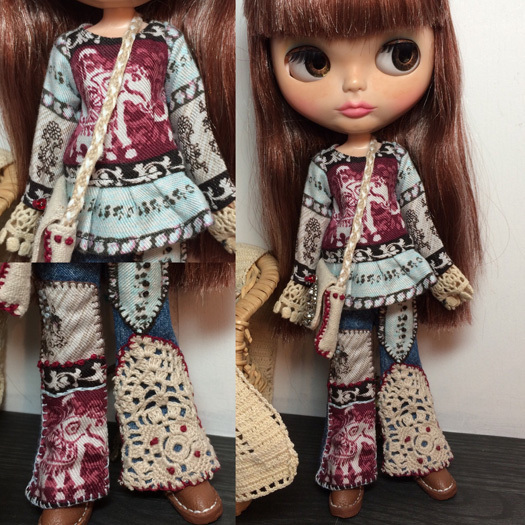 I’d been designing and selling MH fashions quite successfully but had let it slide upon receiving my first Blythe. I spent days sketching designs and creating prototype garments for this fabulous doll. As I said in my intro I had the idea to recreate my hand embroidered patchwork jeans in miniature for Blythe and that was my catalysis for reopening my Etsy shop with focus on Blythe fashion. 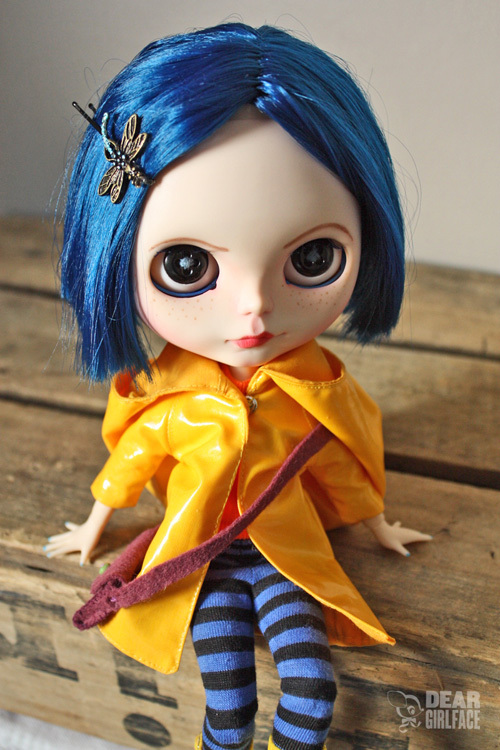 What was the first thing that you sold for Blythe? I posted photos of my original little jean sets on Instagram prior to listing them in my Etsy shop and they sold out immediately. That was a wonderful and positive occurrence! It certainly made me feel that I had made the right choice by following my heart to create the miniature jeans for Blythe. 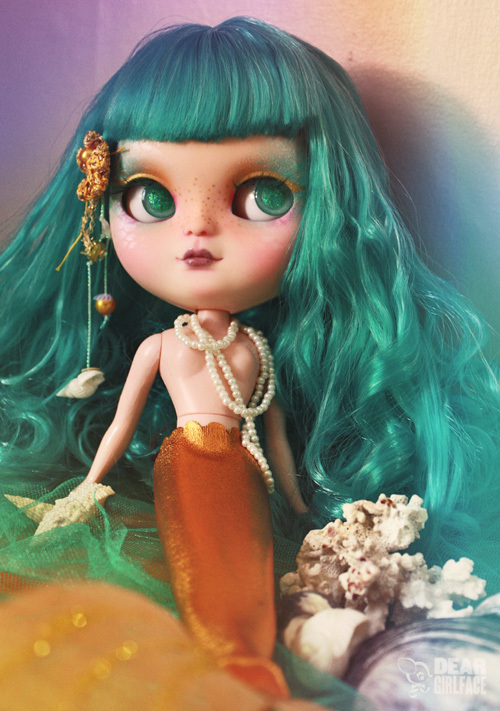 In a sea of Etsy shops, what would you say sets you apart from the other clothing designers for Blythe? It’s definitely my hand embroidered patchwork jeans. There are so many talented and passionate Blythe clothing designers on Etsy as well as those that sell in other venues…a new designer must have a special niche if they hope to get noticed. I put my heart and soul into creating my designs and I believe it shows. 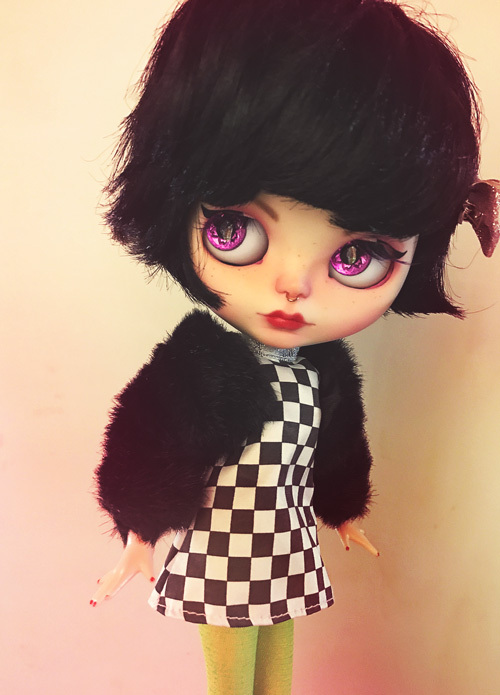 What is one of the challenges you’ve faced with creating clothes for Blythe dolls? I had to redesign my basic jeans pattern a couple times because Blythe’s bum crack was showing when she sat down…it drove me crazy LOL! For me that issue had to be resolved prior to offering them in my shop. It was actually an excellent opportunity for me to create a few different pattern options to use as the foundations for my hand embroidered patchwork. What is a tool that you use that you cannot create without? The haemostats and kelly clamps I use for turning those darn tiny pant legs and sleeves! Tell use a bit about your typical day creating for Mizzfitzdolls? On days I can dedicate entirely to my creative process…this is how it goes. I wake early, shower and dress and head downstairs to my workshop (which I’m very blessed to have) by 8:30 am. Typically I have a few different designs I’m working on all at once, it’s my nature. I’ll get lost in my ocean of fabric for a good hour…choosing the perfect combination of colours and patterns for the project I’m currently working on or perhaps a future one, this is my favourite thing to do creatively. I’ll cut and machine sew until lunch time, take a break and then continue on until around 2:30. It’s a guarantee that I’ll then come back upstairs with a handful of items for hand stitching or embroidery while I watch Netflix. I keep my sketch book floating around the house with me so I can put any ideas on paper right away so I don’t forget. Can you tell us about any upcoming projects you have going on? I’d love to vendor at the 2018 BlytheCon in Los Angeles so that’s definitely upcoming if I’m fortunate enough to be chosen. In anticipation of that possibility I’ve been creating pieces that get put aside when completed so I have stock to sell…worse case scenario is that I’ll have a full Etsy shop if not…it’s a win/win. 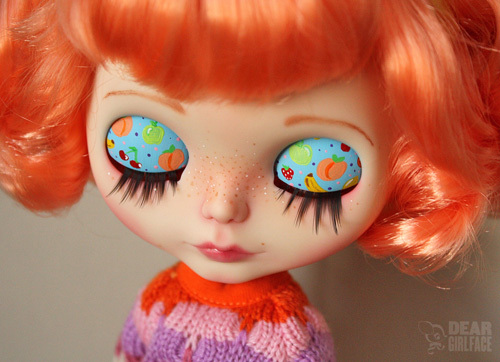 What’s one of your favourite aspects of the Blythe community? Everyone that I’ve had the opportunity to come into contact with since starting to design for Blythe have been so very friendly, positive and encouraging! Thanks for participating in the March Talent Showcase! 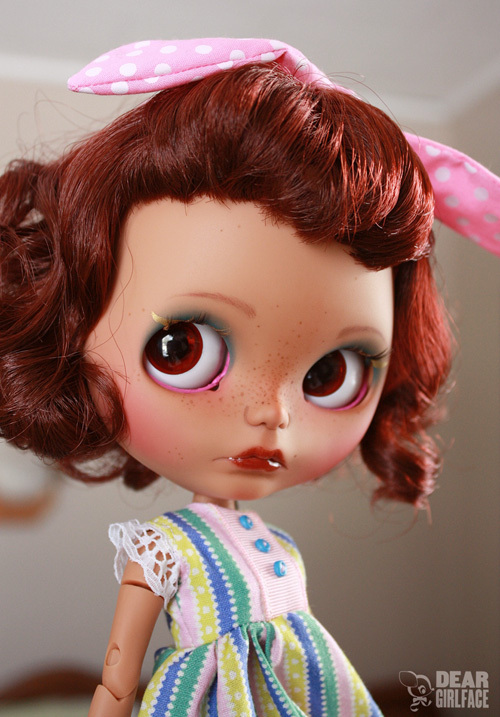 What’s some advice you have for someone who’s starting out sewing for Blythe? Thank you Michelle! My advice for someone just starting out sewing Blythe clothes would be ‘practice makes perfect’…and keep a seam ripper close at hand. Seriously though…just relax and enjoy the process, start off sewing a simple basic one piece dress by hand before proceeding to machine sewing. 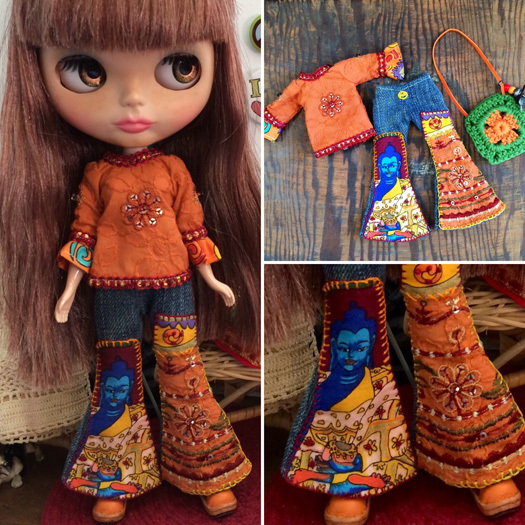 Creating your own Blythe fashions can be very rewarding! You can find out more about Florance and Mizzfitzdolls on Facebook, Etsy, and Instagram. 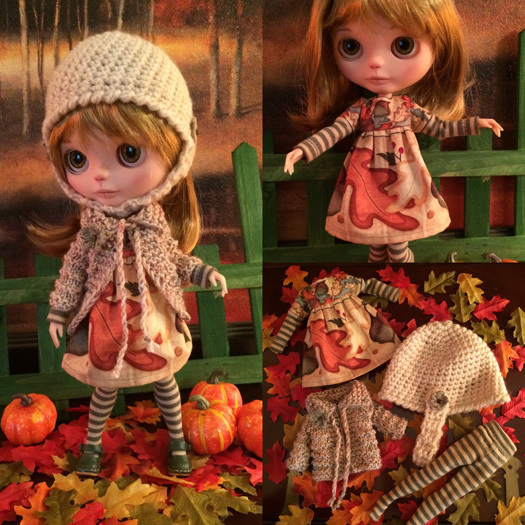 Florance has generously decided to give away an adorable outfit set for Blythe! This outfit consists of the embroidered patchwork jeans, the sweater, and the necklace. The giveaway runs until Saturday March 25th 2017 at 11:59pm Pacific. The draw will be held on Sunday March 26th 2017 and the winner will be announced on BlytheLife.com. Remember to use a valid email address for all comments. If you win, I will be contacting you for your address and forwarding the information onto Florance so she can send you your prize.